An unexpected visitor caused quite a stir at the town hall in Newton, New Hampshire. It was not the guest they were expecting soon after closing Tuesday night at town hall in Newton, New Hampshire. 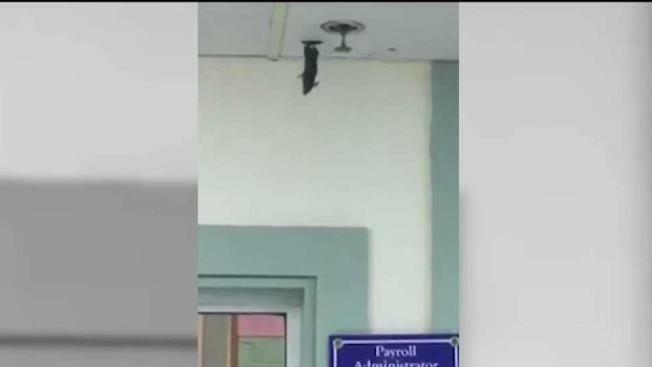 The surprise that came through the ceiling left a few town workers floored, and their attempt to get rid of the rodent was caught on camera. As soon as the mouse started crawling, the women who work at town hall started squealing. They said they had never seen something like that come through the ceiling. "It was just a head at first, and then I saw a little arm come out," said Cheryl Saunders, Newton's deputy tax collector. "Then we knew it was alive." As bookkeeper Kim Hughes was sheltering in her office, town clerk Mary-Jo McCullough started. "We were like, 'Is someone pushing it? Is someone chasing it?' We had no idea what it was doing," she joked. The next question became how they were going to catch the mouse that appeared to playing house just above their offices. Selectmen's secretary Diane Morin came to the rescue. She grabbed a trash can, used a broom to push it over and watched the mouse make a perfect nosedive from the ceiling right into it. "We didn't have much time, that guy was birthing right away," Morin said. "I put the barrel down and it just stretched right out and we were like incoming!" After catching him, they did release him and McCullough posted the video on Facebook with the caption, "Never a dull day at Town Hall." All that is left of the hysterical scene is a tissue-plugged hole and a post-it left by their custodian. It reads, "Please Come Home Willard," but the women hope the next mouse house is somewhere other than town hall.